Dubai’s Al Maktoum International Airport is quickly becoming a major travel hub. It already has a huge selection of routes all around the world. Here is everything you need to know about DWC, including some of the top routes and cheapest flights available. Where is Dubai Al Maktoum International Airport? 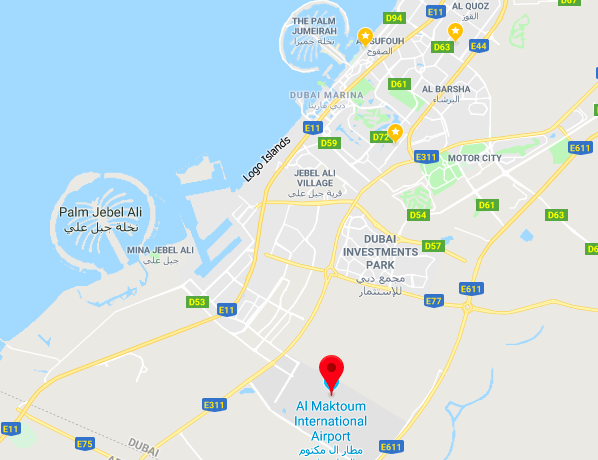 The Al Maktoum International Airport (DWC) is in Jebel Ali between Emirates Road (E611) and the Sheikh Mohammed bin Zayed Road (E311). You can reach it by busses operated the Roads and Transport Authority or by taxi. It’s just under 40km from the center of Dubai. If you’re staying or visiting the Dubai Marina end of the city, this airport is more convenient to reach than Dubai International Airport (DXB). Which airlines operate out of Dubai Al Maktoum International Airport? Airlines including flyDubai, Wizz Air, and Condor all operate out of DWC. The airport opened in 2010 as a cargo airport but began operating passenger flights in 2013. In 2019 it will increase its workload when Dubai International Airport closes its southern runway for repairs. Emirates and other airlines will operate some of the affected flights out of DWC instead. Read more about the Dubai International Airport runway closure here. Where can I fly to from Al Maktoum International Airport? There are hundreds of flights every week to destinations including India, Sri Lanka, Italy, Greece and the Philippines. *This article was published March 2019. Information and prices correct at the time of publication but may be subject to change.